It can get easy to be plagued by the stresses of daily living. One of the most effective antidotes to nerve-racking days is to read. Reading a good book for a few hours can contribute to your wellness – but this can only become possible if you do it without interruptions. It is for this reason why you need to learn a few reading room ideas. Are you ready to take charge in designing your reading nook? Reading can mean a lot of things to different people. To many, it is a way to escape from the rigors of work or studying. Since this is so, there must be comfortable seats in your literary space. Invest in plush seats; it pays to have some oversized cushions, a Middle Eastern floor pallet or some bean bags. A comforter or even a woven throw can provide warmth on an extra chilly night. It is important to set up a private nook if you ever want to finish reading a literary masterpiece. Living with other people, most of the time, means having less privacy. You can strategically place bookcases or screens so that there is a clear line of demarcation. If you want further privacy, you can set up a closet-type room complete with soft lighting. Ambient lighting should do the trick. Abating noise should be one of your biggest concerns. There are many ways of controlling a room’s level of noise. You can use acoustic tiles on your ceiling while you also install carpet. The carpet is a traditional sound absorber. Adding quiet music is also a soothing way to calm edgy nerves. The layout of the room will also make a difference on the amount of privacy that you will enjoy. Many reading rooms are rectangular because of the need to control lights and to provide the most comfortable reading environment. Since reading requires tranquil atmosphere, then you need to veer away from distracting colors. Use soft hues such as whites, blues, pastels and light greens. The more serene the color palette, the better it is. The correct selection of colors can also affect your mood so choose well. It pays to use your imagination, not just in reading but also, in designing your reading room. Are you a big fan of J.K. Rowling? Then go ahead and decorate your reading space with Harry Potter memorabilia. Use lots of purple. ‘Love Stephen King? Then a splash of red, here and there, would be a nice idea. Search the Internet for other design ideas that will define your taste. Color isn’t the only thing that you should focus on. You also need to surround yourself with stuff that offer you comfort. Your reading room’s temperature must be regulated. This means that you must have full control of any adjustment knob. 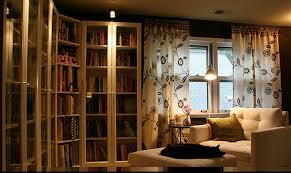 Make sure that the room has ample lights to allow pleasurable reading. A dimly-lit room is likely to damage your eyes. As to the temperature, make sure that the room is not too hot or too cold. A temperature regulator would be a great addition to your reading room. Remember, your goal is to be able to read books without distraction. Many reading room ideas suggest that desktop or laptop computers be given space. Just restrain yourself from checking your emails or social networking sites. While computers are acceptable since there are now electronic books, a TV is a no-no inside the reading room. Your goal is to make a room where you can read and relax at the same time.